Lori had been looking for a rescue dog to keep our ailing blonde Labrador, Shiloh, company in her final years. 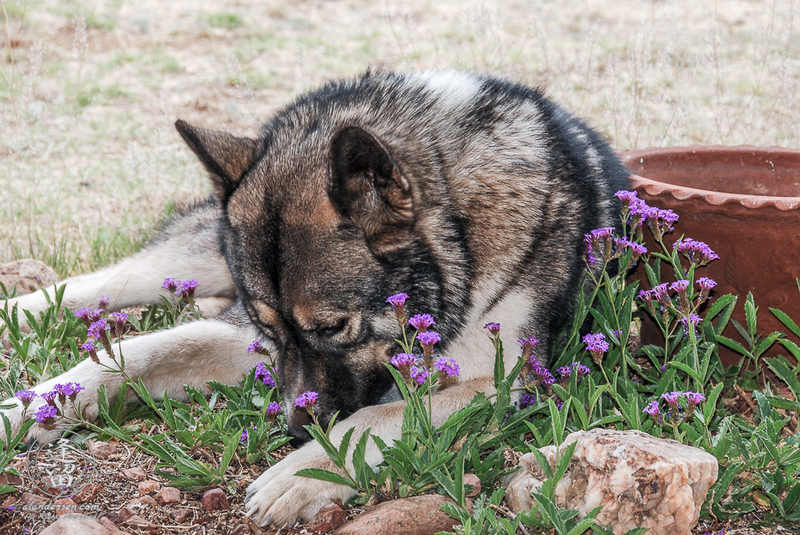 Shiloh’s companion, Dakota, a 3/4 wolf-hybrid, had died suddenly from a brain ailment several months ago and Shiloh was obviously missing him. Lori had honed her search on petfinder.com down to a single male puppy, now 11 months old, called Sundance. 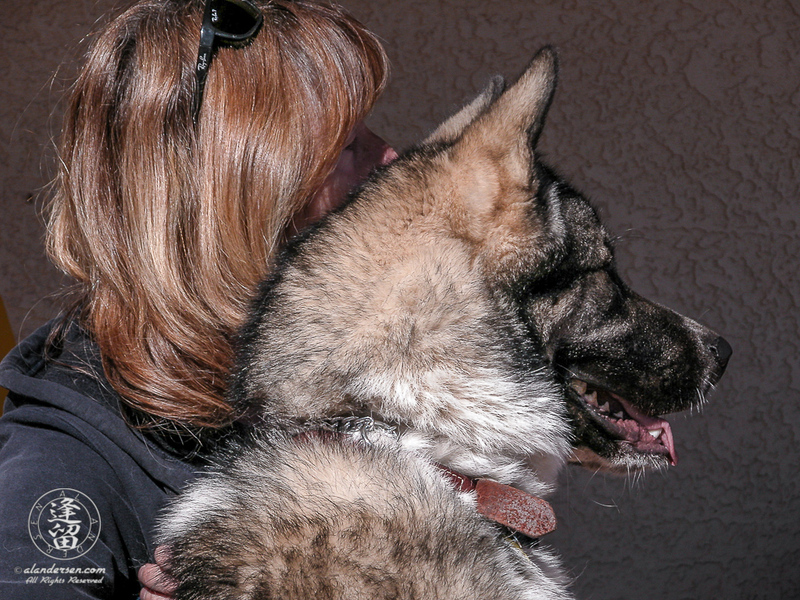 He was living up in Phoenix with the Akita Rescue people. She showed me his photo and asked me what I thought. “Trouble,” I said to myself! “Cute pup,” I said to her. When Lori first mentioned she wanted an Akita I started to research the breed on Google. I found the link to the famous Akita Inu, Hachiko, who’s statue graces Shibuya Station in Tokyo, Japan. After Lori read about Hachiko we decided that if Sundance came home with us he would have a new name, Hachi-ko. 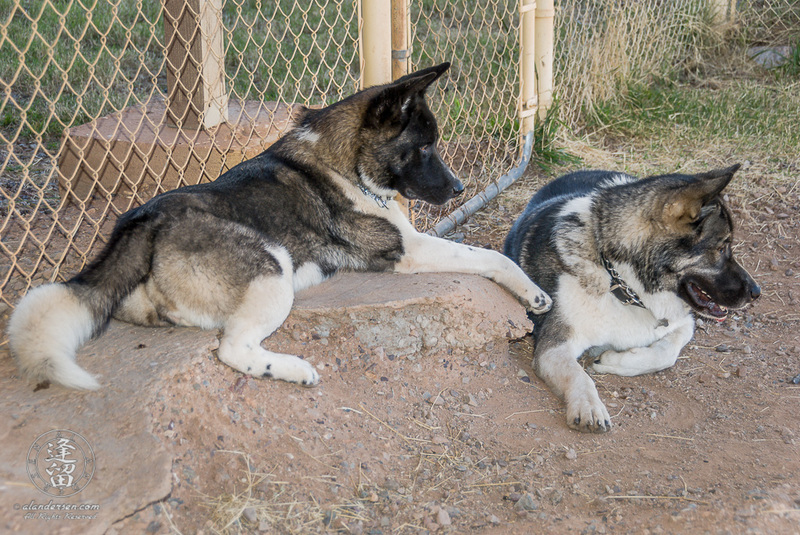 So, here we were in an older suburb of Phoenix, waiting in the backyard of one of the Akita Rescue volunteers to be introduced to a rambunctious new puppy. Juvenile delinquent, was more like it, for he had quite a long rap sheet: evicted from 3 homes for being unmanageable, strong, and pig-headed. He finally made his appearance. He was an inquisitive fellow. First he scoped out Lori and seeing she had no food nor toys, came over to investigate me and my camera. Realizing the camera was not something he could eat or play with, he quickly ignored me and went off to play with the other dog toys, acting like he owned the place and had never been in doggy prison only 30 minutes ago. Yep, he was trouble alright, and it was obvious he had just become the love of Lori’s life. The 3-hour ride home was interesting. Hachi had no problems riding in the car. He loved it, and he wanted to be right there between us even though we kept shooing him toward the back of the Subaru Forester. He stood on the folded-down back seats, looking out the windshield the entire trip, never once laying or sitting down to rest. We pulled into a rest stop just outside of Phoenix to make sure he could do his business. Lori quickly found out that walking 85 lbs of undisciplined muscle and energy by herself was not going to happen any time soon. We pulled off of I-10 onto Houghton Road so we could walk him again, and it was a repeat of the rest stop all over again. He did not listen well and I thought he wasn’t all that bright as I gingerly removed a Cholla cactus sprig from the bottom of his chin. I dropped him and Lori off at a local kennel so I could go home to pick up Shiloh. We had decided to introduce her to Hachi on neutral ground. The meeting went OK, but we saw there would be issues. Hachi was all about play. Shiloh had been queen bee of the roost all her life and demanded respect. Hachi had no clue what respect was. Shiloh tried to explain it to him in dog-terms. He, thinking everything was about him, thought she wanted to play. Yep, he was definitely going to be trouble. Our home became a militarized zone. Hachi had one side of the house and Shiloh had the other. We’d remove the gates for supervised interactions and these were always tense situations, for Shiloh was quite old now and we didn’t want her to get hurt. During one such session Shiloh decided to assert her dominance when Hachi took one of her toys. Hachi retaliated immediately, growling and snapping at her, but did Shiloh no real harm for I had him on leash. Shiloh was afraid of him after that, situating herself on her side of the room so the furniture blocked her from his view. It was sad seeing her abdicate to his dominance. We made the best of things and ensured that she got all the love and attention she wanted and needed. 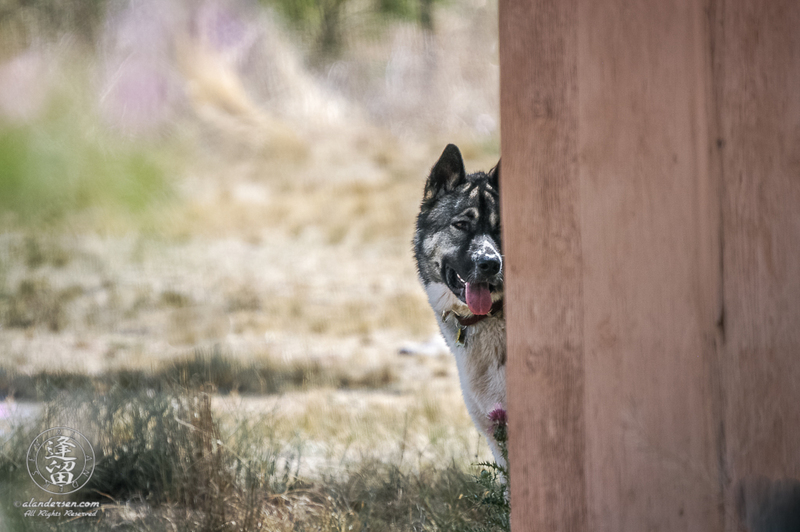 For the next few months we dog-proofed the yard and got Hachi into training classes. He quickly figured out that the fence was too high to jump over but his untrained humans had neglected to ensure the bottom of the field fence was anchored. He scooted right under it a couple times to pursue rabbits, resulting in me having to console a tearful Lori while cursing him under my breath as we frantically searched the neighborhood for him. He’d invariably show up along the back fence line, too dumb to figure out how to get back into the yard he so skillfully got out of. Yep, he was definitely trouble. We took him to his first training class. He was a disruptive handful. It was all about him and if he couldn’t get his way he’d totally flip out. I’d then have to walk him away from the other dogs to get him settled down so he could participate in the class again. He’d leave Lori tearing up in frustration, handing him over to me to deal with when she was unable to control him. It was a learning process for all of us. We did a lot of things wrong, as did he. We got some things right, and so did he. We learned he was motivated by food, which was a good thing, especially when we figured out he loved chicken. Still, if he didn’t want to do something there was no way we could make him do it. Things came to a head one night when I was sitting on the couch, Hachi was laying by the front door, and Lori went over to pet him. I heard a growl. I asked Lori if he had growled at her. She hesitantly said yes. I asked her what happened. She didn’t answer. I got up and went to see what was going on. She had a wound high on her cheekbone, about an inch long. He had bitten her! I was furious. I yelled at him at the top of my lungs, telling him in no uncertain terms that he was a miserable excuse for a dog, that he owed his life to us, and that if he ever hurt anyone again he would be a dead dog! He was shaken up. It was the first time I had ever seen him like that. He wanted to get away from my yelling at him, but I wouldn’t let him. He went and laid on his bed and I yelled at him to stay there. When he tried to get up, I jumped up and yelled at him to lay down. And he did! He stayed on the bed until I told him it was OK to get up and when he got up he came over and apologized, all on his own. Apologies be damned! 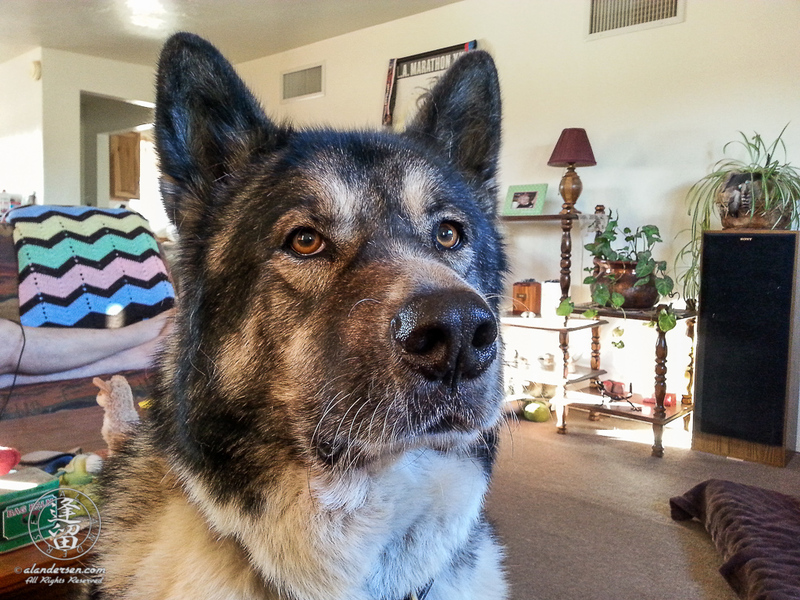 I told Lori that I wanted him out of our house, to call the Akita people and arrange to take him back. She was heart-broken and after a long talk on the phone with the rescue folks in Phoenix, and plenty of time for me to cool off, she convinced me to let him stay. I was hard on him for months after that. He didn’t play with toys unless I said it was OK. He didn’t eat his food unless I said it was OK. He didn’t walk through doors until after I had walked through them. He didn’t get into or out of the car unless I told him he could. He basically had no privileges whatsoever unless I granted them. And I made sure that Lori treated him the same way so he knew that she was master of him and not the other way around. He failed his first obedience class miserably. We enrolled him in another and he failed it too. I was beginning to wonder if he’d ever not be trouble. The funny thing is, he was changing and I hadn’t noticed it. He’d always been a bit of a talker, woo-wooing to greet us, but he was now starting to talk more, sometimes even talking back when he didn’t want to do something, like lay down. His woo-wooing endeared him to people and he loved the affection. Nothing makes him happier than being admired by a crowd of people. He was listening better too. Of course, food treats were a great motivator, but he was also starting to try to listen so he could please us. Nothing upset him more than me yelling at him and he would remember why I yelled at him and try not to repeat what he’d done so I wouldn’t yell at him again. And he always came to me on his own to make up with me when I was upset with him. I was starting to think that maybe he wasn’t such trouble after all. We took Hachi to his third obedience class and he passed, earning his Canine Good Citizen Award! Lori and I think that the instructors were just tired of seeing him, or that they’d just grown to love him like everyone seemed to, and wanted him to have the award. Regardless, he got it and he wears it proudly on his collar. Shiloh got sick and passed away several months after we got Hachi. It was a very sad time for Lori and I. She was Lori’s dog but I grew to love her a lot. I grieved for her quite a long time. 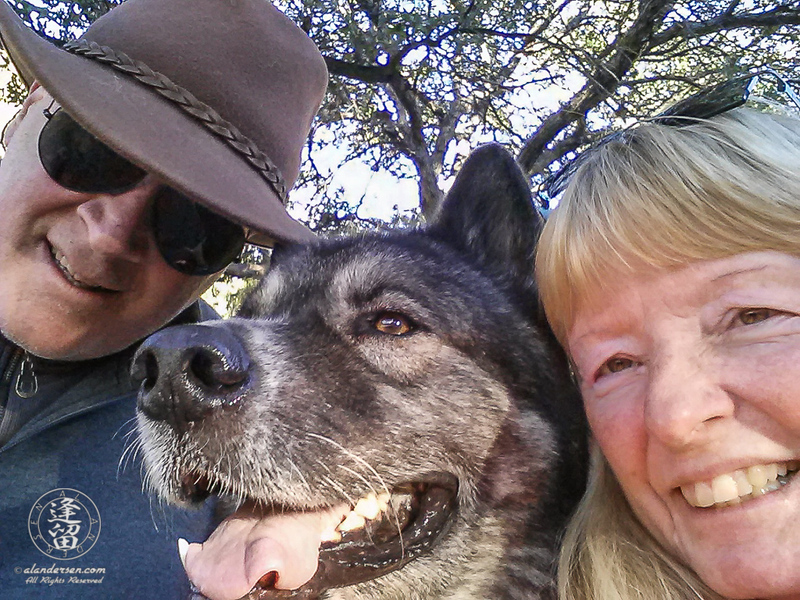 We heaped our affections on Hachi and he thrived. We pushed him to learn new things and he grew. 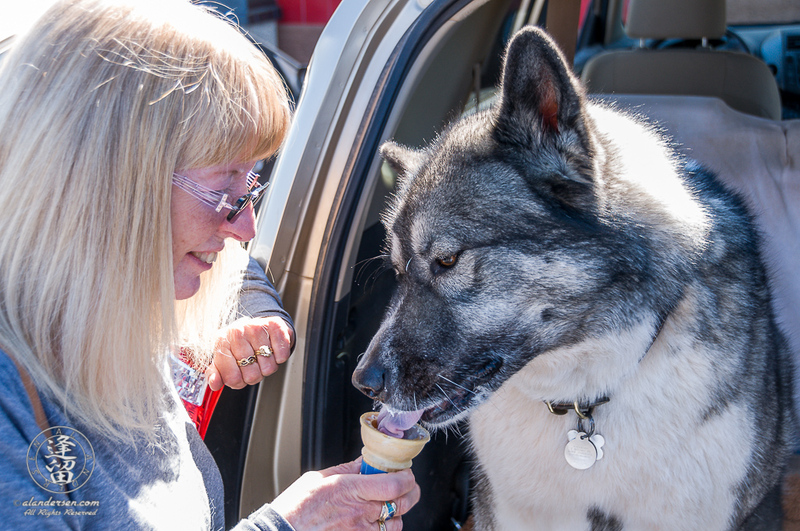 People really noticed Hachi and exclaimed what a great dog he was. Other dogs didn’t quite see it that way. There was something about Hachi that offended other canines. Hachi was always happy to see other dogs, and it seemed the other animals were interested in him too, at first. Then the other dog would invariably want to take a bite out of Hachi. We learned to keep Hachi on leash and away from other dogs except for a few instances where we knew it was OK for him to play with another animal. The problem was Hachi’s size. He had no idea how big and powerful he was and we had to carefully supervise any one-on-one playtime to ensure he didn’t get too rough. 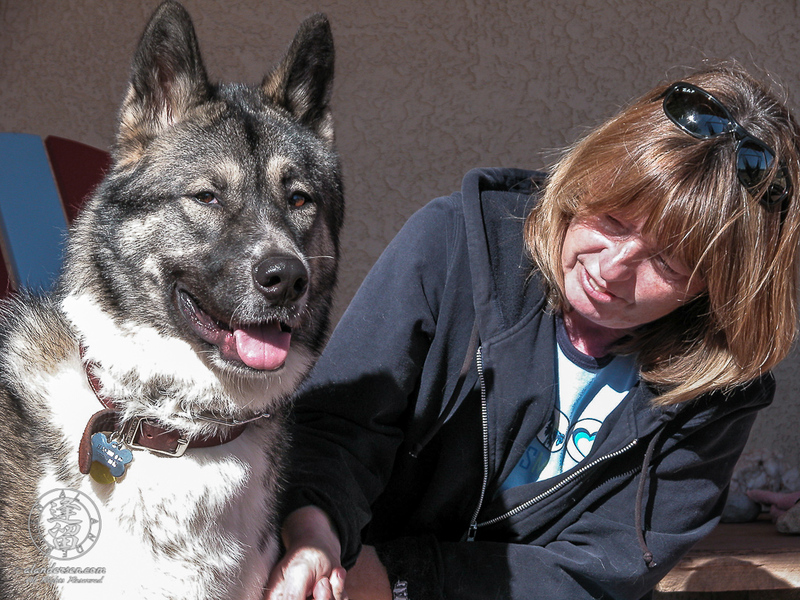 We finally decided he needed a companion and Lori found the most beautiful rescue Akita online in Green Valley. The meeting between Hachi and Kioko want splendidly and they took to each other right away. Things didn’t go well, however. Lori broke her ankle walking Kioko as we brought her home. I had to take care of her and the two dogs for a couple weeks as her ankle bone set. I also noticed that for an unusually small Akita, Kioko had unusually large dumps. One day day I found a load on the tile floor in the bathroom, which was surprising because Kioko was like Hachi, house trained and fastidious about personal hygiene and where she relieved herself. As I went about cleaning it up I noticed it looked strange and when the toilet paper stained red as I picked it up I realized it was blood. The vet said she was bleeding internally and when I mentioned the unusual size of her dumps compared to her diminutive size the vet suspected something was wrong with her liver, making it hard for her to process her food properly. The next day we took her to a specialty clinic in Tucson and they diagnosed her with lymphoma which was already spread throughout her little body. It was best for her that we put her down that day. Lori and I were heartbroken and Hachi was sad for a long time after that, not understanding what had happened to his new friend. We decided not to get another companion for him. We focused our attentions exclusively on Hachi after that, and he thrived. Yes, he would get bored being in the yard all by himself during the day, but he got to go on road trips with us and he loved them! 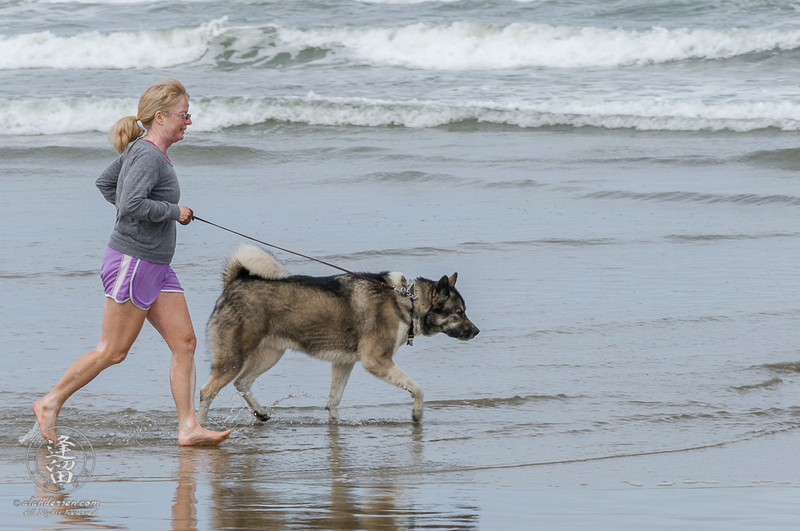 He especially loved the ocean and being able to run on the beach with Lori. 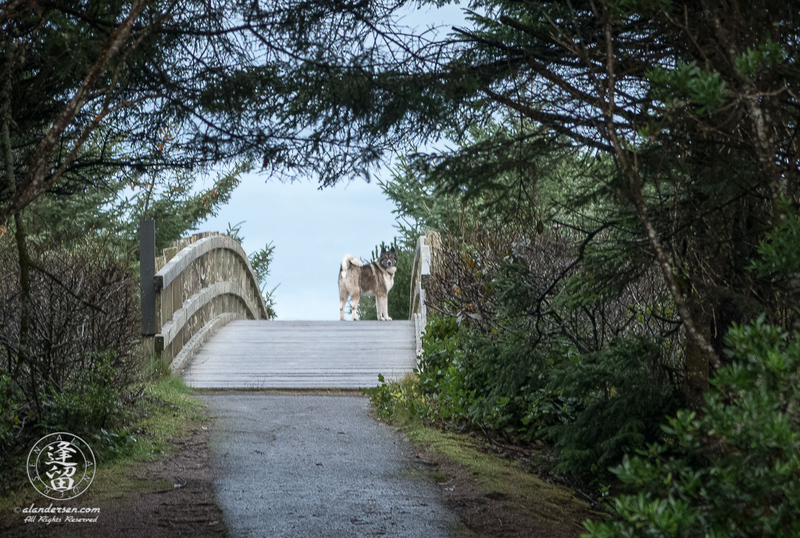 He always loved running with Lori on the roads and the trails, but he especially love trotting beside her on the wet sand with the surf lapping about his paws. He became the most affectionate and well-behaved dog. He loved being with us and doing things with us. He was always eager to please and the slightest admonishment would be all that was necessary to have him not do something he shouldn’t be doing. Just before his last road trip in October 2014, he started to limp occasionally. We thought he had sprained his ankle, would let him rest for a day or two, and he would seem to be better. Still, when he ran around the yard like a mad dog, playing “na na catch me if you can” he seemed to pull a muscle and limp again. The vet said it was a soft tissue issue. He was 8 years old, after all, and needed to slow down. We listened and tried to ensure he didn’t overdo his running and playing. The lameness kept coming and going and we noticed he had some other issues. He’d suddenly get up off his bed and come sit next to us, wanting to be petted. A couple of times I’d find him just standing outside. I finally figured out he couldn’t sit or lay down during those standing episodes so we took him to the vet. Again, they said it was probably a soft tissue problem and recommended we give him a NSAID to relieve any swelling, which seemed to do the trick. However, the lameness kept coming and going, and the sudden getting up to be petted continued. Then two days before Christmas I noticed that the joint above his right wrist was slightly swollen. I called the vet and got him an appointment that afternoon. They took Xrays and told us it was probably osteosarcoma . We were devastated. They told us there was a very slight chance it might be Valley Fever and took a blood draw to test for it. We took Hachi home and tried to figure out what to do. Hoping it was Valley Fever, but planning for the worst, we decided that we needed to make a bucket list for him of things he would like to do while he could do them. Also, his strict diet became a thing of the past. He now gets to eat what he wants. Word came back from the vet that it wasn’t Valley Fever. We made a call to a specialist in Tucson so we could confirm the osteosarcoma diagnosis and discuss pain therapy. We won’t do the amputation. An additional 4-6 months of life is not worth the time lost during the recovery period from the surgery. Discussions with the specialty clinic didn’t give us many options. Anything we did would involve anesthesia which has almost killed Hachi in the past. We decided to keep him with us as long as we could, until the pain becomes too much for him. He loves rides in the car, especially if we stop somewhere to get people food, so we take him everywhere we can and he gets to eat what he likes instead of what’s good for him. He can still walk a mile and if he’s looking strong and showing no signs of pain, we let him go longer, but turn around as soon as he looks like he may be losing steam and favoring his good leg.